here is a short cut of my ways in life…ups and downs! In 1962 Hall­mark Cards was in Europe looking for young artists that they could hire for a year with salary and the trip paid. I was in the end of my 4 years educa­tion in Univer­sity of Arts, Crafts and Design in Stock­holm. Then my prin­cipal and teacher told me that Hall­mark Cards in Kansas City was inter­ested in me, so I could go to Copen­hagen and see them. It happened to be the same day as my grad­u­a­tion. I went there and met Mr. Hall (the founder) and his Art Director. They looked at my port­folio and told me I was welcome. They also found two others from Italy. So after two months I was in Kansas City. That was a bewil­dering time in many ways, in culture and segre­ga­tion at that time, for a young man without any expe­ri­ence. Well, I learned a lot and would have liked to stay but I couldn´t. My visa was just for one year and I had to be in Sweden for two years to go back again. I worked in an agency in Stock­holm and decided to go back to US after two years. During that time I met a girl who was going to San Fran­cisco with a friend to open a dress­makers shop. Now I really had a reason to go back, so I went to San Fran­cisco, lived with her in San Mateo and looked for a job. Walter Landor hired me at their ferry­boat but I didn´t stay long. I didn´t liked it so I quit. I told my fiancée that I would like to go to New York. I had a friend there that I could stay with until she came later, so I went there. My fiancée came to me in NYC and we got engaged. I got a letter from Logan & Carey in San Fran­cisco who wrote that I was welcome to them now that I proved that I made it in NYC. How did they know I was there? Lippin­cott & Margulies raised my salary and wanted me to be design director but my fiancée was preg­nant and wanted to go back to Stock­holm, Sweden. So we did. In Stock­holm we built a family with two kids and a house. I was a successful designer and illus­trator with a lot of jobs and good repu­ta­tion. But I still hadn´t given up my longing for the US so we rented out our house for a year and immi­grated to San Fran­cisco. We bought a house in Mill­brae, kids went to school. I got a rep, Peggy Hamik, and the work came in so every­thing was fine. After a year we had to go back to Stock­holm to take care of our house and see what we should do. My wife went back to Stock­holm 3 months before me. I had to sell the house in Mill­brae and close my busi­ness. When I arrived in Stock­holm, I got a shock. My wife met another man and was going to marry him, it was a terrible time. After a year I went back to San Fran­cisco and started all over again. It wasn´t easy but I tried hard and slowly it was working. My kids came to me during summers. I worked hard to get a good repu­ta­tion. I also got a rep in NYC, Frank Lavaty. Had a couple of shows with good artist and designers. Published in CA maga­zine, Graphis, Gebrauch­graphik and awards in SF and NYC. But I felt lonely and missed my kids so I decided to move back to Stock­holm in 1980. I became more and more inter­ested in making fine art and did so. It has been a lot of exhi­bi­tions all over Sweden, in Europe with several graphic bien­nials. It has also been postage stamps, illus­trated books, TV stage design and so forth, also repre­sented in museums. A book about my life, design and art was published 2004, unfor­tu­nately only in Swedish. Click on the thumb­nail for a larger view and scroll the image to view it all if your window is too small. Lars Melander Promo­tion folder for Cali­fornia Printing. (AD Jack Jannes). Lars Melander Promo­tion poster for Regis McKenna. The idea was to show that the agency only worked with print adver­tising. 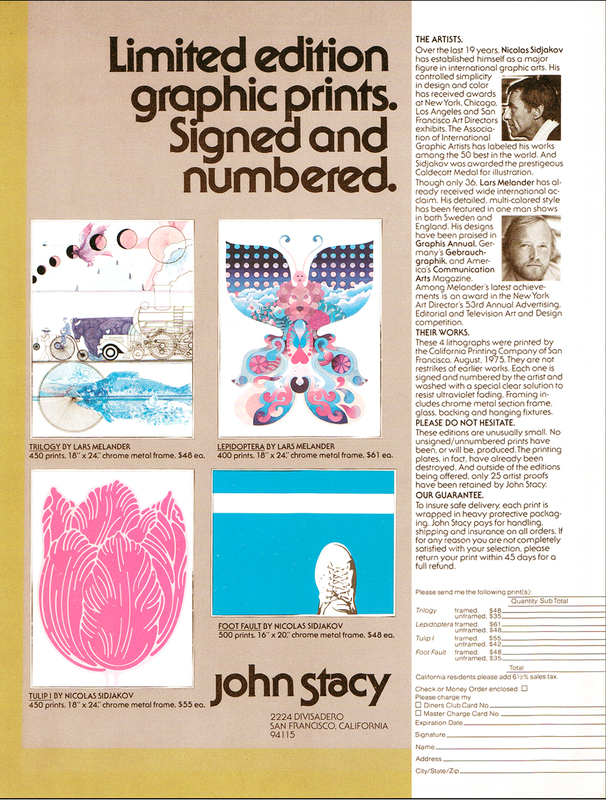 I was invited, together with Nicolas Sidjakov, to make two graphic prints each, limited edition for John Stacy. They were to be adver­tised in the Diners Club maga­zine, all over the USA. Unfor­tu­nately, we did not get the money or the orig­inal artwork.